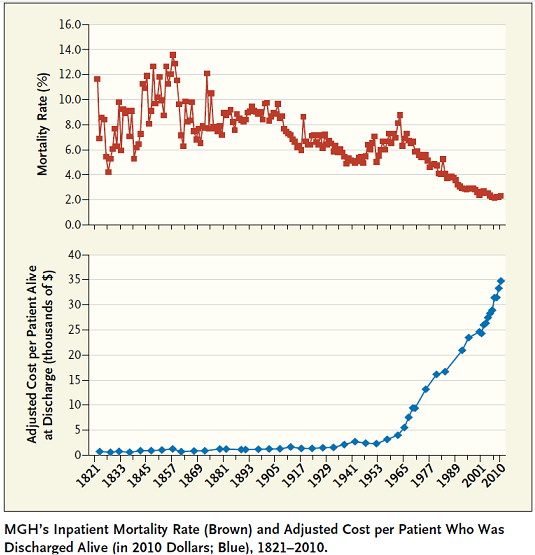 The Source is a paper based upon data collected over the past two centuries on mortality and costs incurred at the Massachusetts General Hospital (MGH). Until 1910, there were flat costs with year-to-year variation in inpatient mortality determined more by world events and epidemics than by the quality of care. Then until 1960 or so value increased modestly with the introduction of novel high-impact therapies, such as penicillin and other antibiotics. For the rest of the 20th century research became industrialized, with complex diagnostics and therapeutics to address an expanding array of diseases discovered and introduced: it now became worthwhile to spend more on health care. In this period, each extra $1,000/patient (2010 dollars) spent on hospital treatment led to 2.4 extra patients being discharged alive for every 1,000 admitted (~$400k to save a life). 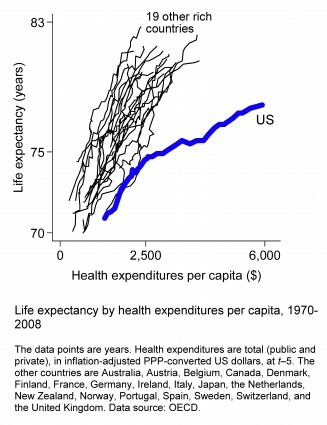 Here’s an earlier article looking at health care costs compared to live expectancy which suggest the US health care system is less efficient than that of other countries.